Writing Groups is one of those things that I've been using for a very long time, without ever taking the time to blog about it here. In my classroom, writing groups are stable heterogeneous groups of students who come together regularly to share their drafts and discuss each other's writing. I began the practice when I was working on my master's degree, shortly after I participated in the summer institute of my local Writing Project. I loved the adult writing group experience and I wanted to bring that to my students. 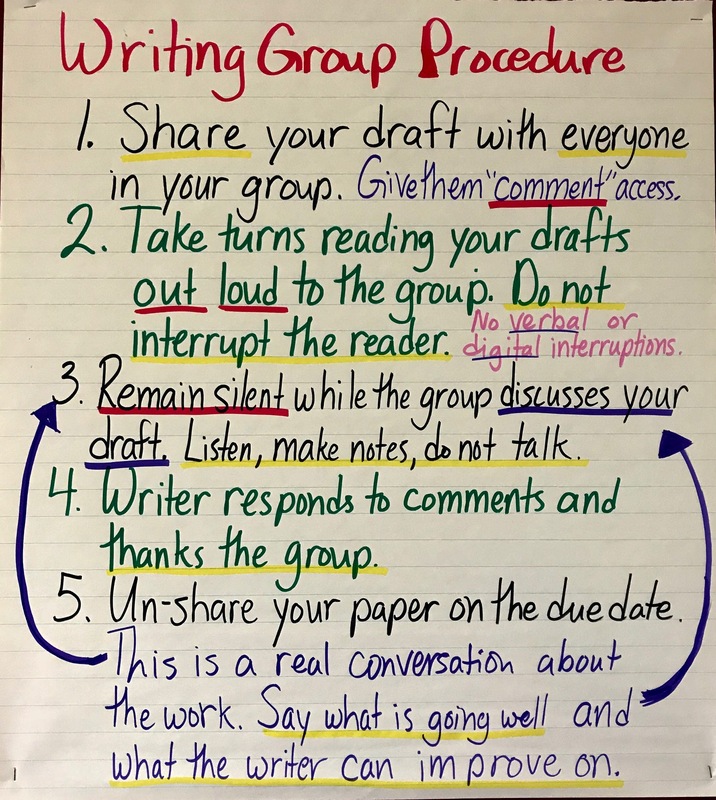 The point of writing groups is to teach students how to give effective feedback about their peers' writing, feedback that goes far beyond error correction and focuses on the quality of the writing. Writing groups also help students learn how to take in constructive criticism. These are not easy skills to teach or learn, but they are valuable, especially in the context of future careers, and communication skills. As an English teacher with 170+ students I want to be able to give all my students feedback on their drafts, but until someone invents a real time-turner, that's not going to happen consistently. Fortunately, research has shown that the feedback of multiple peers can be more effective than the feedback of a single expert. One, there are more of them. When several peers tell a student that something in their writing is confusing, or needs more evidence etcetera, the student writer is far more likely to listen. Second, they are closer to the task. Peers who are working on the same assignment often struggle with the same issues, and can work out solutions together. Three, writing groups give students access to writing that is more and less mature than their own. By reading and responding to each others' work they see examples and non-examples that can help with their own writing. All of this is far better than an individual student writing alone with occasional feedback from a single teacher. The process of getting started with writing groups can be time consuming, but I've created a comprehensive GUIDE FOR WRITING GROUPS to help you get started. Expect to spend parts of several weeks introducing students to the expectations and protocols involved. Have students practice with pieces of writing that don't belong to any of them to reduce the stakes. Expect it to take several rounds of writing groups before students become comfortable with the process and more proficient at discussing each other's writing. For some reason I am receiving a "Whoops! There was a problem previewing this document." message when I try to access the template, and the "Use Template" button just does the Google-is-thinking-about-it spin then times out. Do you know why that might be? Hello Kalyn, Sorry for the delayed response. I know others have been able to access the doc because the've asked me specific questions about it on Twitter. I suspect the spinning icon you get is much like the one I get while the doc loads. It is 21 pages so it takes longer to load in preview, especially if your internet isn't super fast. My advice is let it spin for a few minutes. If you still don't get it let me know and I'll share it with you another way.